The Global Alliance Banned the Commercial Whaling Practice back in 1986, and Japan has been notorious for not following along ever since. Studies have shown that they put whale and dolphin meat on shelves all throughout the world, with false labels as different fish. You could be eating whale and dolphin meant and not even know it. A harpooned whale is towed aboard the Japanese ship Yushin Maru in 2006. “Regrettably, we have reached a decision that it is impossible in the IWC to seek the co-existence of states with different views,” he said. Suga said the commercial hunts would be limited to Japan’s territorial waters and its 200-mile exclusive economic zone along its coasts. He said Japan would stop its annual whaling expeditions to the Antarctic and northwest Pacific oceans, noting that non-signatory states are not allowed to do so. The IWC imposed the moratorium on commercial whaling three decades ago due to a dwindling whale population. 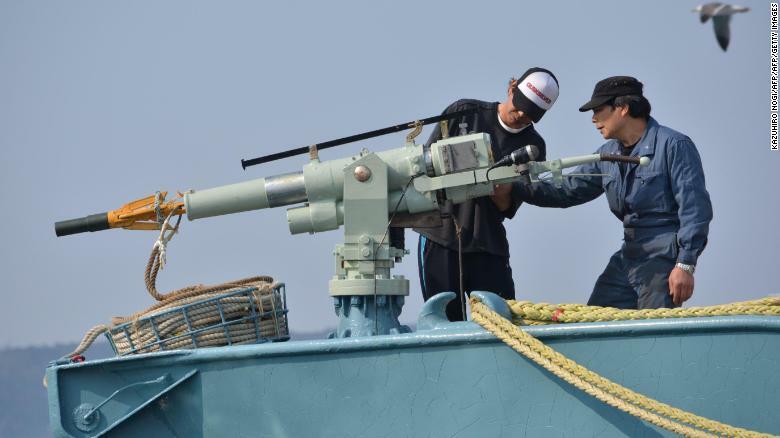 Japan switched to what it calls research whaling, but the program was criticized as a cover for commercial hunting since the meat is sold on the market at home. What’s disturbing is that whale, dolphin and shark populations have not grown during this time frame. They’ve dropped 90% since 1986, partly due to Japan’s continued hunting and other counterparts, like plastic in the oceans and commercial boats using the whale lanes instead of their boating lanes. There are roughly only about 53,000 whales in the world. With Japan hunting 600 whales every season, it won’t take long before we find ourselves in an Endangered Species level of extinction for these intelligent creatures. 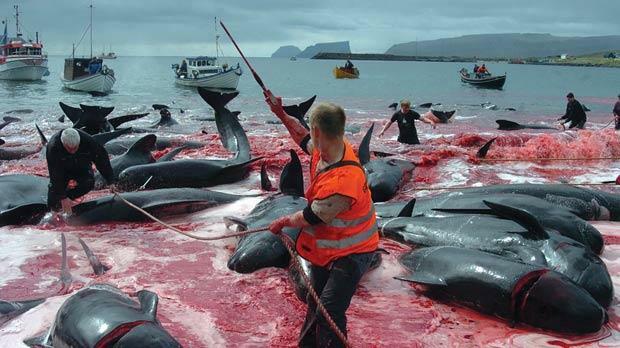 Hundreds of Sea Shepherd activists defending whales from the ‘grind’. There are 500 shark species throughout the world with 100,000,000 sharks killed every year. Disgustingly, even the United States is part of this. You can find dead baby sharks floating around in trinkets in Florida tourist shops, and other popular vacation spots on the East Coast. The sharks aren’t killed first, they’re just put into the bottle with limited water and they eventually suffocate and/or die of starvation, while people watch them on the shelves. Sharks are being slaughtered at an unsustainable rate, with a new study showing that 100 million are being killed every year. They have their fins sliced off and then they’re thrown back into the water to slowly die. Another Endangered Species are the 44 species of dolphins. There are collectively 1 million dolphins, with roughly 500,000 killed each year. More famously, Taiji, Japan is known for it’s aggressive capture of these mammals, and slaughtering of the ones who don’t get sold to a theme park. Watch the documentary, The Cove. Learn what’s really happening, and how you can actually make a difference. With Japan running unchecked by the rest of the world, they could end up becoming the driving force that decimates our oceans even further past pollution and into an emergency state. Enjoy your plastic laden seafood now, at this pace, it won’t last much longer. Previous Previous post: A little girl’s Christmas letter to Dad in Heaven, gets heartwarming response.